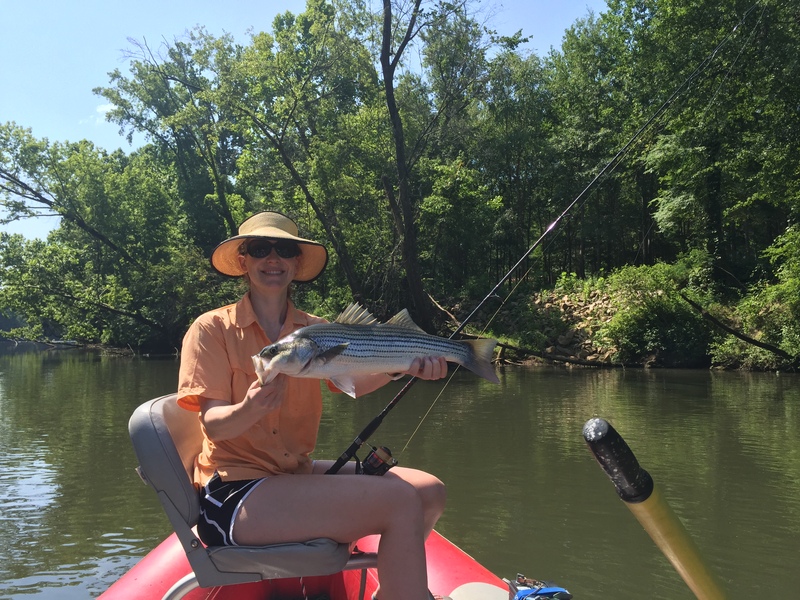 After writing about Columbia’s secret haven for anglers last June, I decided to set out for the Saluda River this summer to try it for myself. 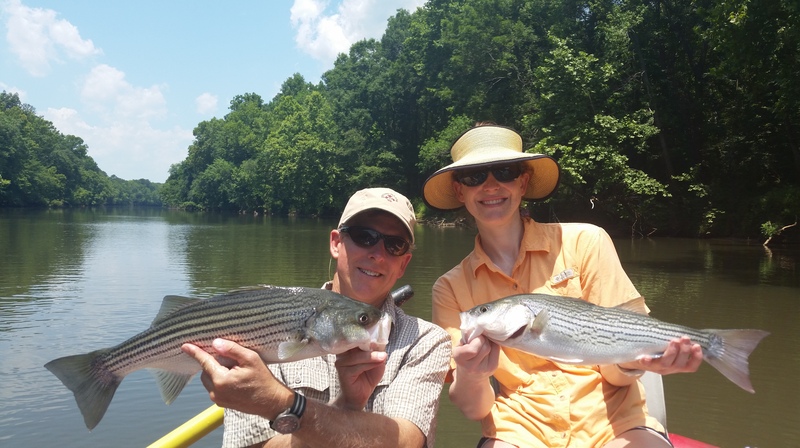 With publisher, and father, Henry Clay, we set out with fishing guide Jake Howard one sultry Friday morning for the Saluda River. A native of Columbia, Jake has been fishing since he was a toddler with his father and has been up and down the banks of the Saluda for 30 years; he intimately knows each rock shelter and pool in the water. He explained, though, that since the flood last October, anglers such as himself have had to become reacquainted with the river as the high volumes of water, 50 times the normal capacity, changed much of the waterscape. We met Jake at 9 a.m. at the Gardendale Landing on Radio Lane and then rode together up to Hope Ferry Landing to put in. The temperatures were already climbing into the 90s, and the air felt stagnant and oppressive up at the parking lot as we slathered our arms with sunscreen. However, once we launched out onto the water in Jake’s raft, a gentle breeze tickled our sweaty faces, and cool drafts of air rose up from the 60-degree water. Because the river is composed of tail water coming from the bottom of Lake Murray, the water temperature ranges from the 50s to lower 60s most of the year, despite being this far south and its low altitude. This allows trout and other species of fish to thrive in a river that geographically would usually be much, much too hot. “The Saluda is a Southern gem,” Jake smiled as he rowed out into the center of the river. “In the summer, it has one of the largest congregations of striped bass on the east coast.” And “stripers” is what we were after this day. As we coasted down the river through calm pools to gentle rapids, it felt like we had retreated into the mountains. All was silent and serene with the pleasant gurgle of the water only interrupted by our conversation and the occasional indignant call of a heron flapping away downstream. 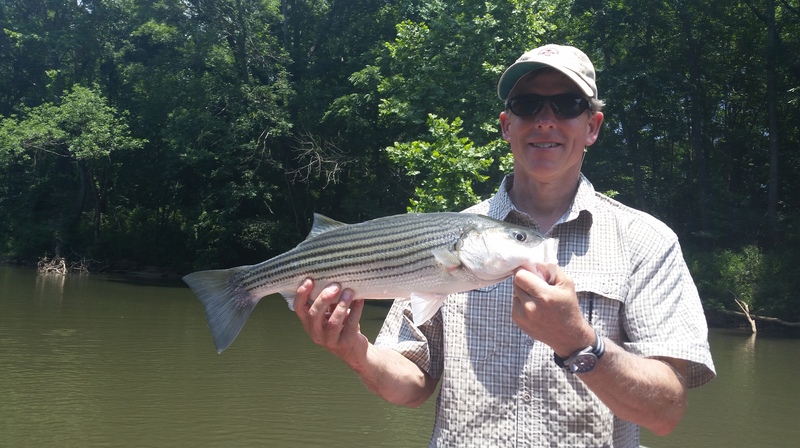 When the first striper slammed my bait, I thought I must have hooked the legend of the Saluda! He hit it so hard I nearly screamed in surprise, and he then immediately began taking out line. Jake coached me as I in turn gave ground and took in line. As I guided him nearer the raft, he cleverly darted underneath a sunken piece of deadfall, and I was sure he would snap the line. 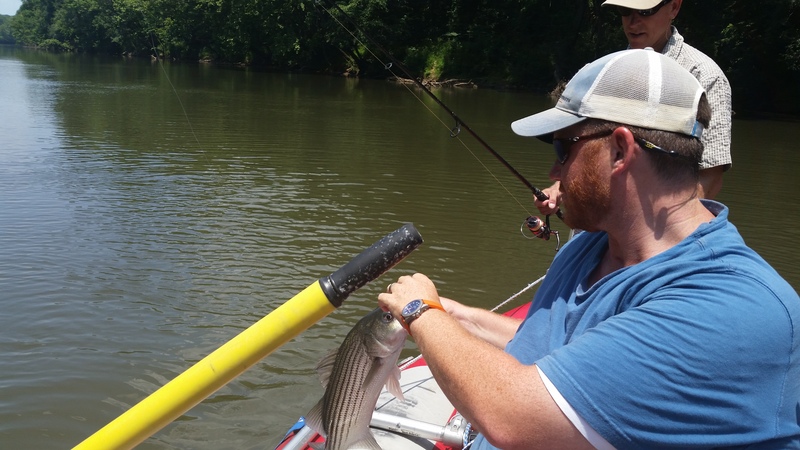 Thankfully I was able to coax him back out and Jake grabbed the leader, pulling out a 4-pound or so striped bass. We were barely able to snap a few pictures before my Dad discovered that his line, abandoned in the water, had too come alive! (He had decided to also switch to bait fishing as Jake had explained that in the summer the herrings were by far the most successful enticement.) My catch was quickly released as we turned our attention to the tug of war ensuing in the stern of the boat. Once towards the end of the morning, we each hooked a fish at the same time and were gratified to land them together. As we approached the Gardendale Landing, a summer storm began to brew downstream but thankfully held off just long enough for us to squeeze in a few last casts. What a perfect introduction to enjoying Columbia’s hidden treasure!